The origins of the company go back to the second half of the 19th century when two brothers, Edwin and William Vinson were tenant farmers in north Kent growing a range of vegetable crops. Strawberry growing commenced when the brothers sublet a small area of land to a marker gardener who planted it with strawberries. As subletting was not allowed within the terms of the lease the brothers took over the strawberry crop and found it to be so profitable that they rapidly expanded and records show some 600 acres were grown. All fruit was harvested and dispatched to the London markets by horse and light van. 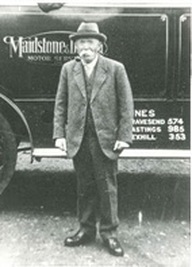 William’s son Edward took over a part of the business and in 1904 made a strategic move to east Kent as much of the land which he occupied was being taken for housing. Initially he bought a house for his family and commuted on a weekly basis back to the farm. During the early part of the 20th century he acquired land around Faversham including some still farmed by the company today. As areas of the land he purchased were planted with orchards the production of a number of top fruit crops were grown in addition to vegetables and strawberries which remain the common theme throughout the company history. ​Faversham was chosen due to the proximity to a main railway line which enabled produce to be dispatched on a daily basis to the wholesale markets in London. Fruit was taken to the station by horse drawn van and loaded into the guard’s van at the rear of the passenger train whilst it was stopped in the station. In the early 1930’s the development of road transport meant that produce was transported directly from the farms to markets by lorry. ​In 1931 Edward Vinson Junior took over the business on his father’s death and steered the business through difficult periods during the Second World War. During the 1950s and 1960s the business expanded rapidly with the acquisition of further farm land and the expansion of cropping, particularly apples and pears to meet demand. The company grew a wide range of crops in addition to soft fruit and also had a pedigree Sussex beef herd. The expansion of the company also included the acquisition of two farms in Suffolk, as land was difficult to acquire in Kent at the time. A number of trends occurred during the 1970s and 1980s which began to change many aspects of farming in the UK. These included joining the EU, the beginning of globalisation and the development of major supermarkets. This put huge pressure on certain areas of the business especially on the apple crop which lost profitability where crops where grown on marginal soils and did not reach sufficient fruit size for the market conditions of the day. Subsequently the two farms in Suffolk were sold and the farming enterprise was focused in Kent. Edward Vinson Junior retired in 1978 and the business was run by Peter Vinson who had been involved since 1963. In the 1920’s harvest workers started picking strawberries between 3.30 and 4 each morning having walked to the farms from Faversham. Throughout the 1930’s about 200 pickers were employed, by this time they were picked up by lorry but had to walk home because the lorries were delivering fruit. During the 1950’s, 60’s and 70’s some 500 harvest workers were required at the pick and these were mostly house wives, many with preschool children and a fleet of buses and lorries were used to pick them up from Faversham, Sittingbourne, Whitstable, Herne Bay, Dover and Folkestone. During the 1970’s, 80’s and 90’s the supply of local seasonal labour became less available due to alternative part time jobs being made available. Most farming enterprises began to recruit seasonal labour from overseas through the Student Agricultural Worker Scheme administered by the Home Office. By the turn of the century harvest workers were recruited increasingly from new member states of the European Union. The business values it's seasonal workers and remains dependent on this source of labour for harvesting crops. In 1999 a strategic decision was made to stop growing orchard crops and focus on soft fruit and since that time the company’s farms have produced strawberries, raspberries, blueberries and blackcurrants. In 1986 Peter Vinson commenced a strawberry breeding programme, initially as a hobby which subsequently has become a major commercial enterprise within its own right. This allowed the development of a strawberry propagation business growing plants of varieties developed within the breeding programme. Peter Vinson was not the only family member to have an acute interest in new varieties. In 1886 Edward Vinson Senior was invited to visit Laxton’s Nurseries in Bedford to view a new variety named Royal Sovereign. He took with him a barrow boy to help judge the value of the fruit. The barrow boy consumed so much of Mr Laxton’s whiskey that Edward Vinson decided to order some plants even though he was not that impressed with what he saw. Royal Sovereign was improved to be the major variety grown for the next 50 years. Edward Vinson Junior had an interest in new variety development and was in contact with strawberry breeders during the middle part of 20th century. He was influential in persuading Robert Reid, the Scottish strawberry breeder, to release a variety named Red Gauntlet which was grown by the company for some 40 years. Today the company’s activities are run in 3 divisions: fruit production, plant breeding and propagation.